It has become common place for experienced side saddle riders to post links of craptastic side saddles from eBay onto their Facebook pages, warning newbies to stay away at all cost! This is a question that experienced side saddle riders hear all too often from new comers who are desperate to get started and all too often rush out and buy the first ‘side saddle’ that they see for a cheap price on ebay. Be warned, those who buy cheap, buy dear! 1) colour, good black sidesaddles are very unusual. Most good sidesaddles are brown. 2)Panels – most good sidesaddles have white linen/serge panels, when viewed from behind off the horse the left panel should appear more padded than the right. 3) Price – Alas you are unlikely to pay much below £1500 for a good, solid well made second hand sidesaddle nowadays. 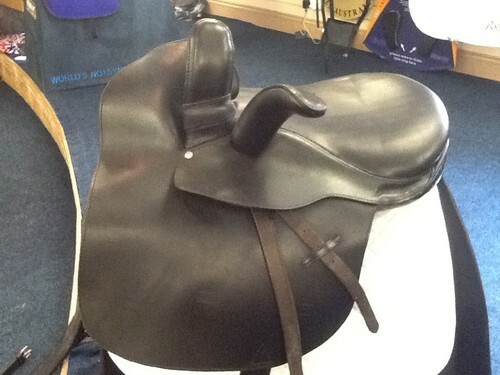 A brand new, well made saddle is more likely to be pushing £2500 – £3000. 4)If you see a saddle advertised as “nearly new, only used 5 times etc, great starter side saddle” for a low price, be very suspicious! It is most likely unrideable, and will turn some poor unsuspecting rider and their horse off side saddle for life!